The package films were a smart move to keep Disney financially solvent during a challenging time. The downside was limited resources to make the animation reach the level audiences expected. When a movie doesn’t look like Bambi, packing multiple stories into one feature isn’t going to make you forget it. The way to resolve this issue is to bring in familiar characters like Mickey and Donald or deliver something engaging like the story of the Headless Horseman. Sometimes even that approach isn’t enough, however. This is the case with Fun and Fancy Free, which arrived in 1947. It includes two half-hour segments that range between okay and surprisingly forgettable. Jiminy Cricket helps to connect the stories by setting the “fun and fancy free” tone, yet neither short really fits that description. The seven-minute introduction takes a long way to get going, and even the familiar presence of the Pinocchio character only does so much in creating the right atmosphere. 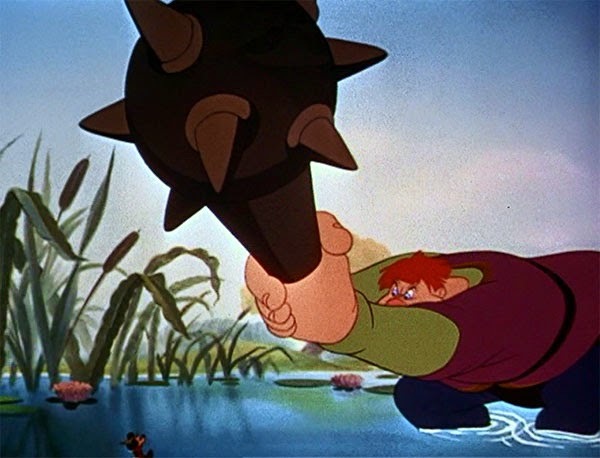 The standout is "Mickey and the Beanstalk", and Disney has kept it in the public consciousness through subsequent releases and use of the characters. That isn’t true with "Bongo", adapted from the “Little Bear Bongo” short story by Sinclair Lewis. Our host puts the LP on the record player, which brings narrator Dinah Shore into the mix. She uses her trademark delivery and singing to describe the story of a circus bear that ventures into the wild. His fellow performers treat him horribly, so Bongo is ready to stake out new territory. The animals in nature aren’t much better, though he grows on them. What changes Bongo’s fate is meeting the pretty Lulubelle and falling in love with her. This creates some problems with the local bully Lumpjaw, who also wants her. It’s a pretty generic scenario. There are a few well-done scenes within the lackluster story. Shore croons a dreamy tune while Bongo falls to sleep, and the sounds of the woods take over. This relaxed moment has the right mood, though it only lasts briefly once the lightning and other obstacles start pursuing him. Bongo has no luck! The biggest challenge through all this mayhem is the animation, which is well below Disney features from the time period. It’s easier to bypass the diminished quality if the story is entertaining. That doesn’t happen with this slow-moving opener. My daughter Elise asked “when is this gonna be over?” after 20 minutes, and she’s only five. Her standards aren’t always that high for animated fare. 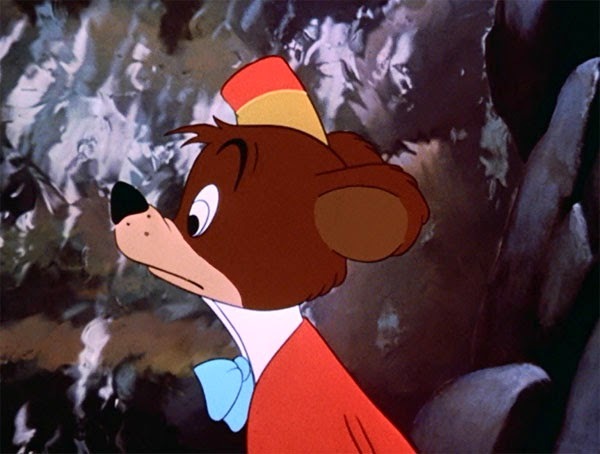 Disney was really fond of expressing love through hazy visions that resembled drug-induced trips. 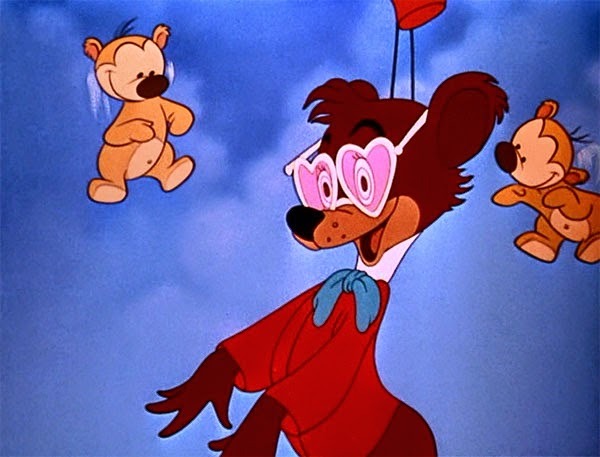 When Bongo falls for Lulubelle, the vision includes balloons, pink clouds, cupid bears, and other peculiar images. Another challenge is the gender dynamics, which involve two guys battling like cavemen over a woman’s love. She prefers Bongo but allows their conflict to continue even when serious injury could happen. Even when the contest involves log rolling and a dangerous waterfall, it’s hard to get too excited. I should also mention that the bears profess their love through a slap. This is one of the odder Disney films that I’ve seen, but there isn’t enough craziness to make up for a messy story. It’s a relief to move on to "Mickey and the Beanstalk", though we must first experience one of the strangest birthday parties of all time. 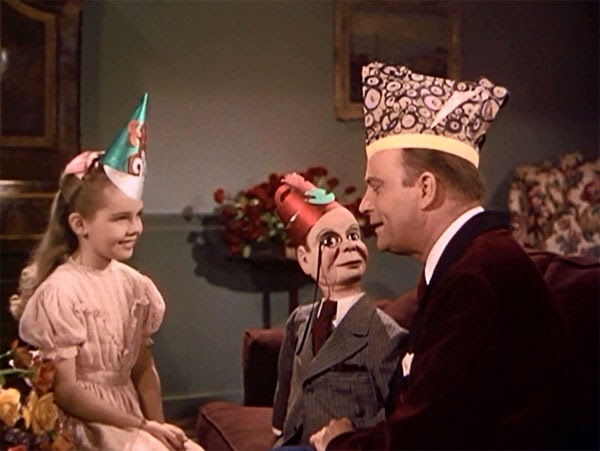 Jiminy Cricket arrives at a girl’s party where the only guests are Edgar Bergen and his puppets Charlie McCarthy and Mortimer Snerd. On a side note, I just discovered that McCarthy and Snerd have their own IMDB pages with bios that call them actors. Does the girl have any other friends? The young actress playing her is rough, and getting through this fairly long opening is a challenge. 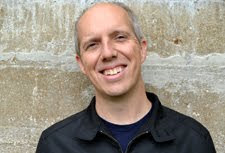 Finally, Bergen decides to tell a story and takes us into the variation on "Jack and the Beanstalk." Mickey, Donald, and Goofy appear with their normal personas to draw us into this tale. The story is very familiar, so I won’t spend much time on the particulars. Mickey sells their cow to help the starving trio, but all he gets in return are three magic beans. Thankfully, this prize grows into a beanstalk that leads to a castle. The bad news is that the structure houses an angry giant. The opening is well-done, and Donald even grabs the axe to kill the cow in a hungry mania. It really helps to know their characters, which brings a smile from the start. It doesn’t represent the best appearance from any of them, however. This did bring a lot more interest from Elise, and the time flies by during the action-packed climax. There’s also a ridiculous finale with the giant arriving at the birthday party and frightening Bergen. That inspired moment almost made up for "Bongo". I’ll close out this marathon next week by looking at Disney’s work to support our nation’s efforts during World War II. Numerous projects were put on hold, and the output helped to keep the company afloat during a difficult time. I’ve seen a few already and am curious to see how they tried to present this country and the war in the best way possible. The Disney marketing team brilliantly released these package films as separate stand alone video segments with edited introductions. Each tape ran from twenty to thirty-five minutes and since it was all that was on that tape, kids did not get bored waiting for another story. So Bongo, The Reluctant Dragon, Mickey and the Beanstalk and the others were all individual products, much more digestible, although dismissive of the history of the production. I remember seeing Mickey and the Beanstalk that way when I was a kid. I'm surprised they even bothered with Bongo, though I guess there was still a market for anything they did. It's nice to see the feature like it was originally presented, even with the thin connections between the segments.